“Builders of peace” from the Islamic Society and Temple Rodeph Torah admire their creation. Rabbi Shira Stern posed a challenging question to religious school students at Temple Rodeph Torah of Western Monmouth County: If you were to build peace, what would it look like? On April 16, those students joined others in providing a multi-faith answer. At a Shabbaton at the Reform temple in Marlboro, a colorful vision of peace was created by nearly 100 people: TRT students in grades three-seven, their parents, and nearly 50 students and adults from Masjid Al-Amaan — The Islamic Society of Monmouth County in Middletown. 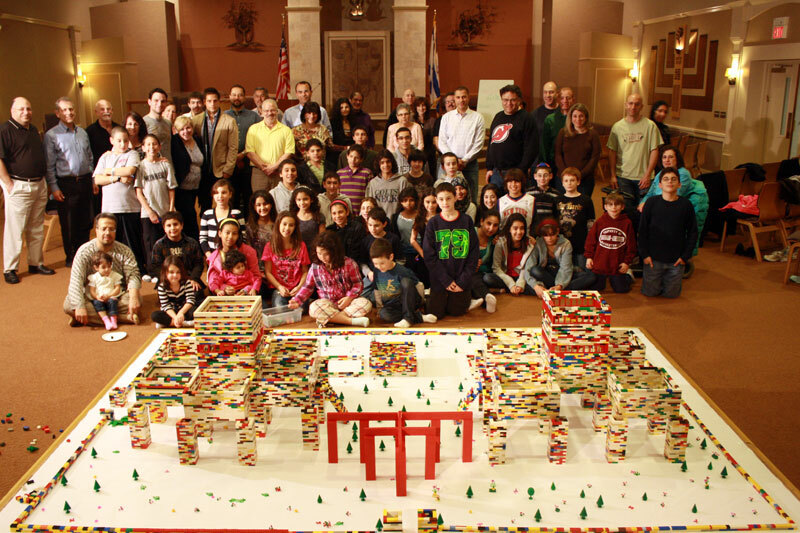 The project was directed by architect Stephen W. Schwartz, AIA, of SWS Architects in Livingston, who conducts about 50 Building Blocks Workshops each year. 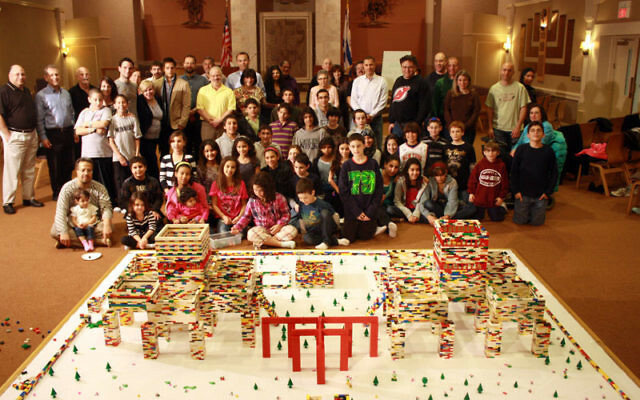 Most of his hands-on educational projects depict sites of Jewish heritage, including models of Jerusalem, Masada, and the Warsaw Ghetto, and the world’s tallest LEGO menora. The LEGO structure was built on columns, symbolizing that “we all live on this earth together,” Schwartz said. From the common meeting area, called the Courtyard of Abraham — the patriarch of origin revered by both religions — two sets of stairs led up to two sanctuaries, one Muslim, one Jewish, situated side by side. The best time to do that is when children are young, she added. “I was listening to all the rhetoric about the Ground Zero mosque and thought this was a great opportunity for students to learn important lessons that are not influenced by partisan politics and the animosities adults often harbor,” she said. At the Shabbaton, members of the mosque taught about the Five Pillars of Islam: unity of God, prayer, charity, fasting, and pilgrimage. These five points were represented in the columns in front of the model building and in the five rooms that comprised the Muslim praying area. Stern, together with her husband, Rabbi Donald Weber, who is TRT’s religious leader, taught six points of Judaism represented through the six rooms in the temple. They structured the points into two sets of three, forming a visual star of David as inverted triangles: God, Torah, and Israel and study, worship, and deeds of lovingkindness. The study session was followed by a Middle Eastern supper. For 11-year-old Matthew Beck of Morganville, a fifth-grader at TRT, the Shabbaton was unlike anything he has ever experienced. “I was really, really surprised how it turned out. It is very interesting how similar our religions are, and how much fun we could have building with LEGOs,” he said.